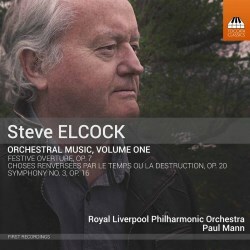 British composer Steve Elcock was born in 1957 and is largely self-taught, having leaned the violin to Grade 7 and obtained an ‘A’ level in music. His first piece to be professionally performed was Hammering in a Manchester premiere conducted by James MacMillan in 2009 and this led to an increasing number of public performances of works for various combinations of instrumentation. This now is the first CD of his music. Symphony No.3 was composed between 2005 and 2010. Its opening paragraphs are knotty and brassy, an impression almost immediately softened or contextualised by the reflective stillness of the music that follows - only for the resinous vehemence to erupt once more. It is an augury of a strong element of Elcock’s compositional procedure – brusque alternations of mood, frequently oscillating almost defiantly between the two states. The powerful percussive statements and constant sense of instability and flux mark out this brittle battling first movement whereas there is a grotesque element to the second movement March. This is subverted by a Big Band appearance and some mocking themes, even though it’s not immediately clear what is being mocked. Conductor Paul Mann’s full and understandably partisan sleeve notes align Elcock’s procedure to Anglo-Nordic writing (that’s to say broadly Brian and Simpson to Sibelius and Nielsen) and maybe there are bloody-minded elements here at least reminiscent of Brian, though it’s true that the independence given to the percussion is perhaps predicated more on Nielsen’s you-know-what Symphony. Surging in tempo extremes as well as brusque alternations in mood and percussive violence may not suggest the most serene of symphonic statements though with a finale as long as the first two movements combined one is assured of a long Passacaglia drenched in defiance. There is also a gauzy lyricism to be heard here, though characteristically it’s pretty much snuffed out by militant percussion. Written in 2013 Choses renversées par le temps ou la destruction takes the Prelude No.14 in F sharp minor from Bach’s Well-Tempered Clavier, melds it into a brass chorale and then subjects it to a process of diminution. The process continues in the central movement where a different sonic atmosphere arrives as does complex rhythmic interplay. Strangely I was reminded in a few places here of Vaughan Williams. There’s an almost filmic sense of colour and texture in Elcock’s high winds and stirring strings and excellent use of the harp. One feels the work in a sense being pulled in different stylistic directions – or at least there being a tension in musical means. The slow final panel of this intriguing work absorbs strongly lyrical elements but also a café-style harpsichord and viola ‘duet’; a larky, parodic insinuation that lends the music a deliberate ambiguity. If these questionings seem pervasive in the little of Elcock’s music that has thus far been explored – what is being parodied? Why the Big Band passage in the Symphony? - they are decidedly absent in his sprightly and stirring Festive Overture of 1997 with its really rather Waltonian central section. The performances are strongly energized and if a few more patches might have tidied things up further, there’s no doubting the commitment of conductor or orchestra. It will be productive to hear more of Elcock’s music, whether in large-scale form or in the case of some of the chamber music that has been performed of late. It can only act as a spur to consider the range of his compositions and their particular sound worlds and inspirations.